Incoming Chair of the Appellate Practice Section, Jack Reiter, began the seminar by thanking the Court for its time. Chief Justice Charles Canady graciously voiced his appreciation for the work of the Appellate Practice Section and the role of the Young Lawyers’ Section of The Florida Bar in organizing and promoting the discussion. Reiter then introduced Caryn Bellus, Chair-Elect of the Appellate Practice Section, who led a lively discussion, posing a number of questions to the justices. Bellus first asked each justice to give his or her professional background before being appointed to the Court. Notable among the anecdotes told by the justices were the stories of success and failure that each experienced along the way. The justices were also asked to describe their responsibilities at the Court, apart from deciding cases. The justices’ many roles range from exercising rule-making authority to imposing discipline, and from serving on Bar and Court committees to volunteering within their own communities. Chief Justice Canady serves as the chief administrative officer of the entire Florida court system, which often requires trouble-shooting and solving problems. 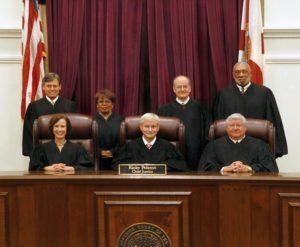 When asked the toughest part of the job of being a Florida Supreme Court justice, several justices mentioned the tedium associated with the Court’s rule-making authority. The justices also highlighted the differences between the Court and the three-judge panels of the district courts of appeal. Given the sheer number of cases before the Court, all of which must be decided en banc by the Court’s seven members, the justices noted that it can sometimes be difficult to convince another justice to vote for a particular outcome. While the caseload can be demanding, and the work unrelenting, the justices greatly value their role in the judicial process. Justice Jorge LaBarga opined that being a supreme court justice was the best job of all. The invitation to the justices to “describe your pet peeves” resulted in the usual responses: overly-long briefs and lawyers who do not know or – worse, still – misrepresent the record. Chief Justice Canady mentioned that he finds any attempt by lawyers to denigrate opposing counsel or the lower tribunal to be especially coun- terproductive; Justice Ricky Polston was surprised to find that some lawyers will actually interrupt the justices at argument. The justices emphasized that although appellate counsel should always know the record, it is far better to admit that you don’t know an answer to a question than to misrepresent the record at oral argument. The justices were then asked whether they had any advice for nervous lawyers arguing before the Court. Justice Peggy Quince responded that as a young appellate lawyer, she always welcomed questions from the court. She emphasized that lawyers should listen to the questions asked by the justices, as those ques- tions often give the lawyers insight into the Court’s concerns. With the exception of legally and factually complex appeals – like the recent redistricting cases – the Court does not often extend the length of time granted for oral argument. While the Court does consider motions to extend the time for argument, those motions are rarely granted. Questions as to the potential impact of budget cuts on the courts had no easy answer. The justices noted that the statewide budget for the clerks of court had been cut by $30 million. This reduction, the Court believed, would affect the clerks’ abilities to fulfill their duties, even as the clerks tried to minimize the impact. The justices cautiously broached the sensitive question of merit retention. Education is key. The justices urged Florida lawyers to take responsibility for educating the voters, few of whom understand the history of the merit retention system and its importance in maintaining an independent judiciary. The lawyers in attendance were reminded, once again, that practicing law is a privilege, and one we must act to protect. Rebecca Bowen Creed is an appellate lawyer with Creed & Gowdy, P.A. She earned her undergraduate degree from the University of Virginia and attended law school at the University of North Carolina at Chapel Hill, where she graduated with honors. She is board certified in appellate practice by The Florida Bar and a member of the Section’s Executive Council.